Sydney has had the longest Indian summer this year, with months of extraordinarily barmy and mild weather, temperatures in the mid-twenties, clear blue skies and warm ocean temperatures, which meant people were still happily swimming in the ocean all throughout May. You would think I could just accept this glorious weather and enjoy it but I have a darkly, pessimistic side and I am already looking ahead to the summer (a savage El Niño event is on the cards, with predictions of record-breaking temperatures, bushfires and drought). I also come from a small rural community and, as every good farmer knows, you can never be too optimistic about anything, because nature, fate and that once-in-a-hundred-year drought is always waiting in the wings to drag you down if you get to feel too cocky about your luck. I’ve been making this soup for a few years – it’s one of my favorite winter soups for a mid-week meal. Not only is it incredibly quick and easy but it has a lovely depth of flavour from the garlic, celery and olive oil that makes you feel like it’s been slow cooking all day on a wood-fired stove. The wilted greens on top make this a complete meal: serve it with crusty sour dough bread, it’s so warming and sustaining, you won’t miss the passing of the clear blue skies of the Indian summer. 500 grams of washed winter greens – spinach, silver beet, cavalo nero or kale, are all good. Heat olive oil in large pan, add onion, celery and crushed garlic and saute gently until softened (about 10 minutes). Add tomato paste, stock, water and beans to pot, bring to boil and simmer gently for 20 minutes. Season with salt and pepper, take a ladleful beans from soup, mash them and return to the pot to thicken the soup. To cook greens, heat oil in frying pan and add leaves with a dash of water, cook over high heat, tossing until all the greens are wilted. Drain and roughly chop. 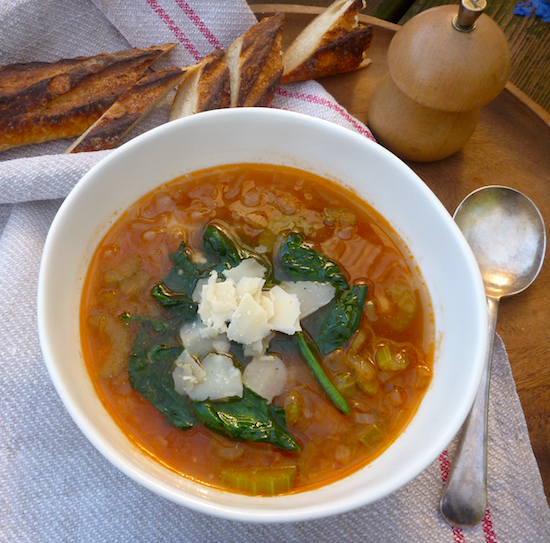 Ladle soup into shallow bowls, top with greens, parmigiano and black pepper, and drizzle with extra virgin olive oil. I’ve been feeling much like you described – sure the warm weather was nice (we had something similar in Melbourne) but it made me uneasy as I know it’s just a sign of what is to come, and also a clear indication that our climate has most definitely shifted. On the flip side, your soup sounds delicious! I have been getting into a rut with soups lately, so I shall have to add this to my repertoire! I’m with you on being happy that the cooler weather has finally descended, it unnerved me to be so warm all through autumn and speaks of a tough year ahead again next summer. I am ALL over this one. I have a bunch of kale sitting in the bottom of my fridge that I was going to make kale chips out of but that I think would be better in a big bowl of this gorgeous looking soup. The weather here in Tassie is most conducive to soup and adding greens to a bowl of hot steaming comfort food is a great way to eat them. It must soup weather by now in Tassie, this is just the thing to warm you up. Absolutely beautiful and easy to make soup – as I am just home from hospital and not particularly strong out of bed – this will be my restorative for tomorrow’s lunch! As far as our impossibly long summerish autumn is concerned, feel just the same way as you! What will next summer bring? Was too close to bushfires last spring for three whole weeks!! 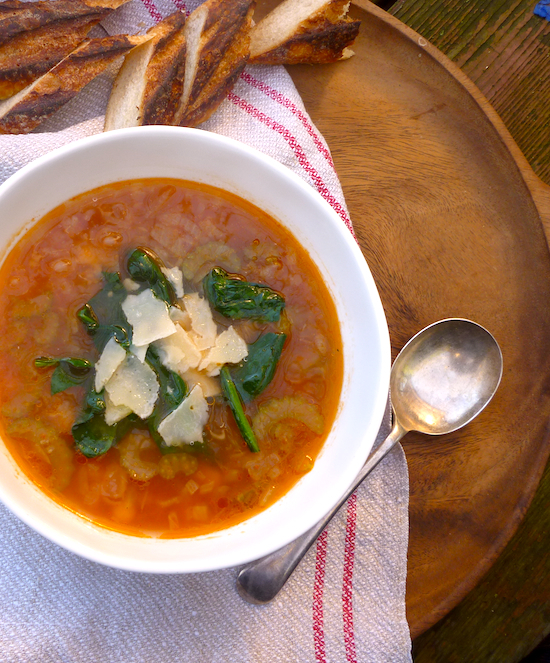 A delicious soup, very easy to make and full of goodness. Thanks for sharing the recipe!